In the article below, Andrew Forbes, Visualisation and Virtual Reality Specialist at SLR, discusses the vast benefits that virtual reality can deliver to the Landscape and Visual Impact Assessment process, and introduces SLR’s prototype VR app. Background: What is an LVIA? Landscape and Visual Impact Assessment (LVIA) is the process of evaluating the effects of a proposal upon the landscape. LVIA forms part of an Environmental Assessment, which is required in support of planning applications with significant environmental effects. As part of the LVIA, a photomontage would typically be produced. This is a 3D representation of a proposed development, superimposed into a photograph, forming the visual content necessary for the LVIA. Photomontages must be extremely accurate and will often involve survey teams to ensure images are as precise as possible. As a 3D visualiser at SLR, working alongside landscape professionals, I’ve gained substantial insight into the methodology behind the LVIA process. SLR’s visualisation team produces interactive real-time models for public consultation, portraying the visual impact of a development on its surroundings. To support this, we’ve started developing and integrating virtual reality (VR) technologies into our workflow, offering a wealth of advantages over the traditional method, and significantly enhancing the experience of viewing LVIA photomontages. 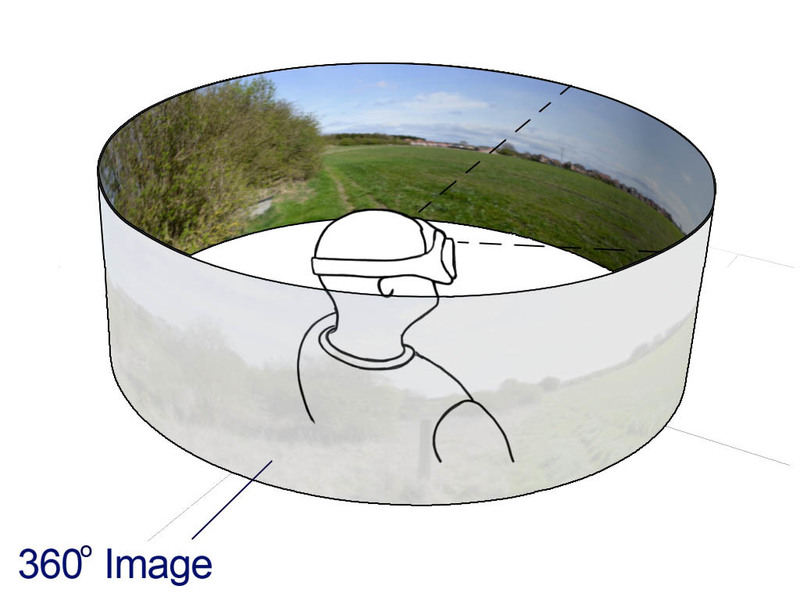 We’ve now developed an app incorporating 360° panoramas for mobile VR headsets which will aid in the process of producing LVIAs, and we’re looking to test the software soon. Our app allows the user to switch between existing and proposed photomontages at the touch of a button without breaking the immersion. Ultimately, our goal is to add value to the projects by streamlining the workflow for landscape professionals and facilitating intuitive decision making. The final representation of the image. The purpose of a photomontage is to give the landscape professional the tools with which to assess the impacts of a proposed development. To this end, the montages must replicate the experience of standing at the point the photograph was taken, with the proposed development overlaid into the image. To make the photomontages available to stakeholders, the images are printed. LVIA guidelines state that printed photomontages are subject to being displayed at a specific viewing distance; this distance is intended to ensure the image correctly reconstructs the perspective seen from the point at which the photograph was taken . To appreciate the correct effect, printed panoramic photomontages should either be curved around the head of the viewer, so that each part of the image is the correct distance from the viewer’s eye, or the viewer should pan across the image with the eye remaining at the correct viewing distance. Both approaches are clearly impractical and diminish the integrity of the photomontage by increasing the margin for error and possibility for misrepresentation. Additionally, there is a lack of agreement as to how the image should be displayed; guidelines laid out by the Landscape Institute, Scottish National Heritage and the Highland Council require the production of multiple sheets to assess a single viewpoint. This can require up to seven framed sheets, which must be assessed individually and then as a whole. As you can envisage, this is not immersive, and requires imagination from the landscape professional to place themselves in the location of the photomontage. This is where Virtual Reality offers a viable alternative. VR can currently display 360° panoramic images in an inherently immersive way, placing the user at the location of a photograph with full head tracking – this means that if part of the development is behind you, you must physically turn your head to look at it, as you would if you were stood in that location in reality – this satisfies the need to correctly reconstruct the perspective at which the photograph was taken. This is crucial for large or linear infrastructure projects such as pylon routes, windfarms or major road networks, as often the developments stretch over many miles. Equally, it helps the understanding of smaller developments due to the immersive nature of the content. We currently have examples of both in our prototype app. The VR approach also removes the traditional need for numerous photo-sheets of the same viewpoint, due to the fact that the whole 360° photomontage is viewable in a single space. SLR’s Visualisation team believes in simplifying the visual communication of complex problems. As visualisers it is our job, not only to produce accurate photomontages, but also to provide instinctive and clear methods of visual communication. We create one image per viewpoint, which is viewed in a more intuitive way, in order to assist the viewer in making judgements based on a truly representative experience. Please get in touch if you would like to help with testing the prototype app and providing your feedback. With the recognition that this technology can add significant value, we aim to alter the industry guidelines and develop the most practical and beneficial solution for LVIA.